I think I would like to be in Amsterdam tomorrow. April 30th is Koninginnedag (Queen's Day) in the Netherlands, celebrated with orange food, banners, and "extreme amounts of orange clothing and creative accessories" to commemorate the queen's birthday. 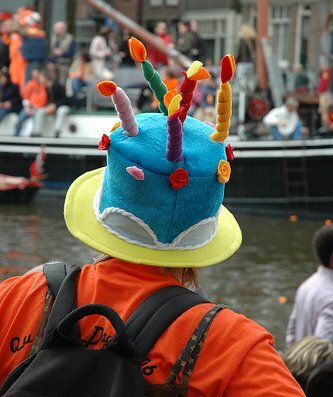 Photo by Hans Bouman; the rest of his Queen's Day set is here. 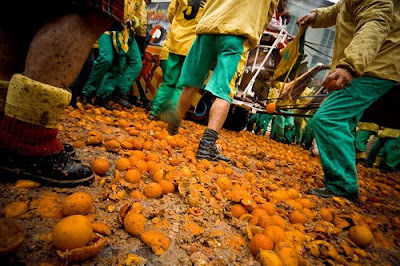 And then there's the Battle of the Oranges in Ivrea, Italy which takes place during Carnival, 40 days before Lent. Apparently reenacting a historic insurrection, teams throw oranges at each other. A lot of oranges. I'm fascinated. What other orange holidays am I missing out on? Photo by Semantico; see the whole set here. You have read this article random with the title April 2008. You can bookmark this page URL http://jenkrebs.blogspot.com/2008/04/orange-holidays.html. Thanks! Maybe your bedroom needs something orange? Mary found this vintage chenille bedspread for sale and sent over the link. I think it's great, but I don't need it! Anybody want to give it a good home? You have read this article shop with the title April 2008. 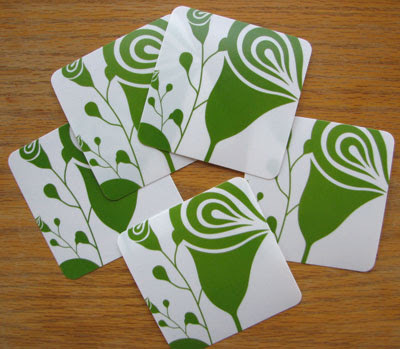 You can bookmark this page URL http://jenkrebs.blogspot.com/2008/04/maybe-your-bedroom-needs-something.html. Thanks! Check out Kitsune Noir's Desktop Wallpaper Project: a new submission from an artist will be featured every Wednesday. To see the collection so far, click here. This one is from Mike Perry. 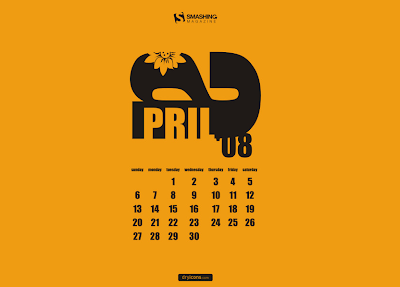 You have read this article desktops / downloads with the title April 2008. You can bookmark this page URL http://jenkrebs.blogspot.com/2008/04/artful-desktop-wallpaper.html. Thanks! 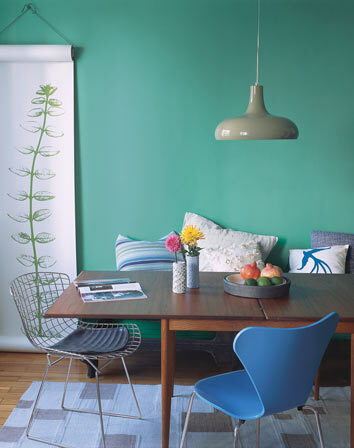 Domino Magazine has a gallery of 50 lovely rooms with paint colors listed for your reference. 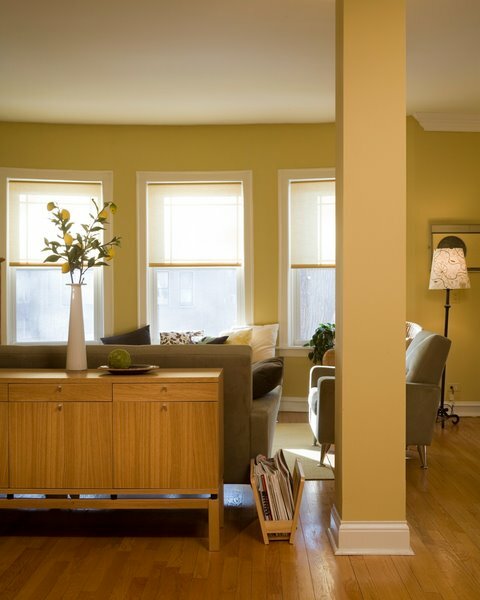 Take a look if you're thinking of redecorating. As we all know, paint colors can have rather unusual names. (Wouldn't it be fun to name paint as part of your job? Does anybody who reads this blog do that? Do share!) If you think you're good at guessing a color based on a name, try this quiz. It's hard. Good luck. You have read this article decorating / resources / time-wasters with the title April 2008. You can bookmark this page URL http://jenkrebs.blogspot.com/2008/04/paint-color-inspiration.html. Thanks! Send a geoGreeting written in the most unique typeface ever: each letter is a building somewhere in the world, viewed from above using Google Maps. If you've got lots of spare time on your hands, feel free to spend some of it combing the earth in search of better letter shapes. The creator of geoGreetings, a grad student at the University of Minnesota, welcomes submissions. And happy Earth Day! You have read this article time-wasters with the title April 2008. You can bookmark this page URL http://jenkrebs.blogspot.com/2008/04/hello-down-there.html. Thanks! My friend Megumi sent these plastic coasters from Japan (purchased at FrancFranc). Aren't they cool? She always knows what floats my boat. You have read this article coasters / favorite things with the title April 2008. You can bookmark this page URL http://jenkrebs.blogspot.com/2008/04/nifty-coasters.html. Thanks! You have read this article art / favorite things / shop with the title April 2008. You can bookmark this page URL http://jenkrebs.blogspot.com/2008/04/i-like-rex-ray.html. Thanks! Recently I came across etsy seller Perdoozy, who makes "pin up girl aprons." They're awfully fun and would make unique bridesmaid gifts. (Assuming your bridesmaids are the cooking type.) And business is booming for Perdoozy, since she's sold almost 500 of them, each handmade. Wow. You have read this article shop with the title April 2008. You can bookmark this page URL http://jenkrebs.blogspot.com/2008/04/hot-little-numbers.html. Thanks! You have read this article paper / tutorials with the title April 2008. 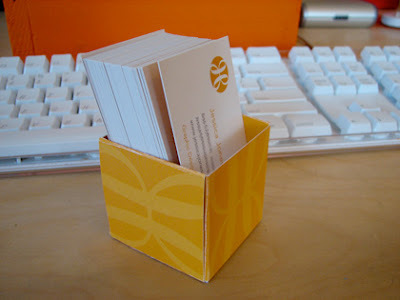 You can bookmark this page URL http://jenkrebs.blogspot.com/2008/04/business-card-box-made-of-business-cards.html. Thanks! You have read this article quizzes / time-wasters with the title April 2008. You can bookmark this page URL http://jenkrebs.blogspot.com/2008/04/ikea-quiz.html. Thanks! You have read this article favorite things with the title April 2008. 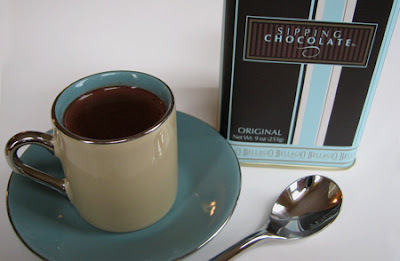 You can bookmark this page URL http://jenkrebs.blogspot.com/2008/04/sipping-chocolate.html. Thanks! The fabric I designed will be shown at a textile trade show in L.A. next week, thanks to some fancy footwork by Caroline of jcaroline creative. With one week to prepare, she managed to slipcover a sofa and do up pillows, a crib set, a lamp, dining chairs, a tablecloth, napkins, totes, and cosmetic bags. Yeah. Just a few things, right? She employs some wonderful ladies who helped pull this off at the speed of light, all culminating in an emergency photo shoot by Brooke Schwab Photography. 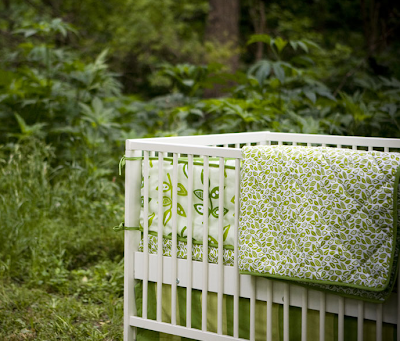 Brooke took some gorgeous pictures for the booth—you can see more on her blog right here. I'm embarrassed to admit that meanwhile, all I did was stay in Chicago and send pesky emails. Caroline and Brooke, you are both amazing. I'm so lucky to know you. You have read this article design work with the title April 2008. You can bookmark this page URL http://jenkrebs.blogspot.com/2008/04/modern-flora-photo-shoot.html. Thanks! You have read this article downloads / paper / printable with the title April 2008. 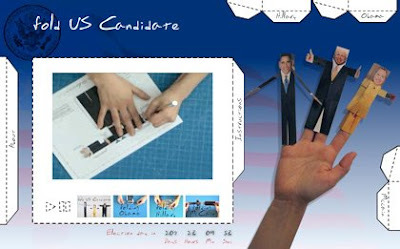 You can bookmark this page URL http://jenkrebs.blogspot.com/2008/04/fold-us-candidate.html. Thanks! I have these teensy, tiny little 2" pieces of origami paper that were begging to be used for something, so here's my idea: fancy paperclips. I should probably label this post a "time-waster" since this is not very practical, but who cares. If you get a kick out of cutting tiny bits of pretty paper like I do, the fun is in the making of them. And who wouldn't love to get a note clipped to a file with one of these? Well, maybe lots of people. But that's okay. 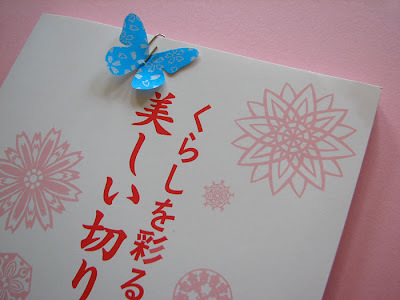 To make some, just fold a little piece of paper in half and cut out a butterfly profile. Free hand it, or click here to get the shape I made and print it to use as your template. 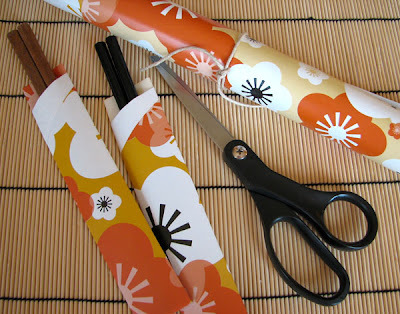 (Cutting tip for accuracy: turn and move the paper, keeping your scissors in the same position.) Open up the butterfly, poke it with a pin, and thread it onto a paperclip. These will probably fall apart after one or two uses, but at least all the tiny leftover scraps of paper in the world can have a brief moment of glory. P.S. That's my new kirigami book from Megumi, which I can't wait to try out. You have read this article paper / tutorials with the title April 2008. 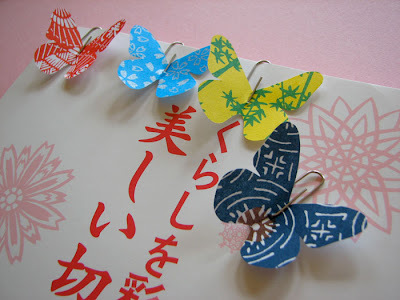 You can bookmark this page URL http://jenkrebs.blogspot.com/2008/04/easy-butterfly-paperclips.html. Thanks! You have read this article downloads / tutorials with the title April 2008. You can bookmark this page URL http://jenkrebs.blogspot.com/2008/04/things-to-make.html. Thanks! Why does the peacock's head face right? Test your brand awareness with this little logo quiz. Kinda fun. You have read this article graphic design / quizzes / time-wasters with the title April 2008. You can bookmark this page URL http://jenkrebs.blogspot.com/2008/04/why-does-peacock-head-face-right.html. Thanks! This afternoon I needed instant craft gratification, so I flipped through my brand new origami book from Megumi to find something that looked cute, easy, and fast. Ta da: chopstick envelopes. These will be fun when Alex and I get take-out sushi and have a little sushi date. The book's instructions are entirely in Japanese, so I might need to enlist the help of a Japanese-reading friend if I get stuck in the future. But the diagrams are great, so I feel confident I can get pretty far by myself. You have read this article books / origami / paper with the title April 2008. 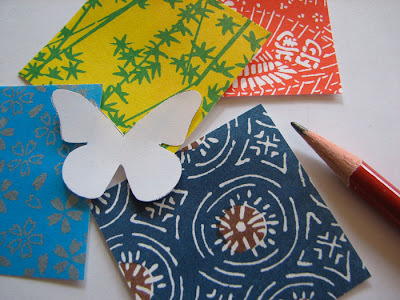 You can bookmark this page URL http://jenkrebs.blogspot.com/2008/04/paper-therapy.html. Thanks! So here's how the AT house tour worked, for anybody who's curious. Last October, an editor from AT emailed asking if we were willing to do a tour of our place. Silly me, I thought that meant they simply wanted some snapshots from around the house, so I dashed off an email saying they could grab some from past posts on this blog. Turns out they send a photographer! Who knew? So months went by, and the shoot finally happened in February. Which cracked me up. 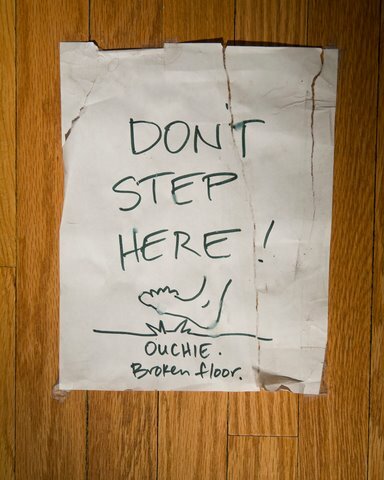 That's been taped to the hallway floor for ages. Obviously. 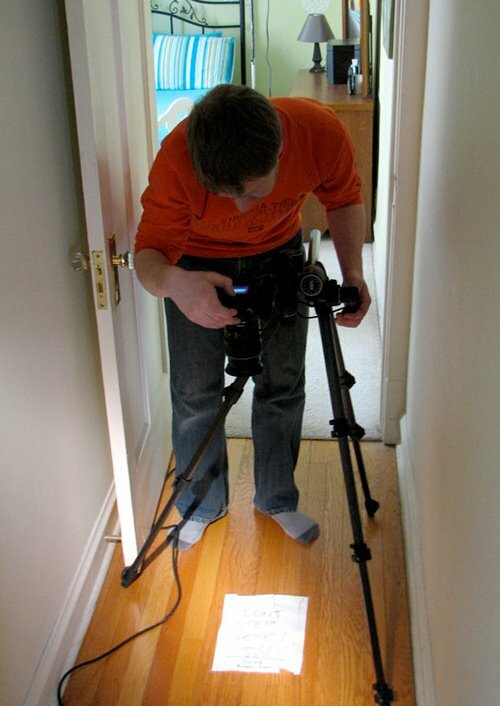 After shooting the rooms, Evan wandered around looking for some interesting little detail shots. Unfortunately, we don't have any interesting little details. He asked if we had any knicknacks or collections, but alas. No knicknacks. So that was it. We hugged, and Evan went home. The end. You have read this article home with the title April 2008. You can bookmark this page URL http://jenkrebs.blogspot.com/2008/04/apartment-therapy-behind-scenes.html. Thanks! You have read this article home with the title April 2008. You can bookmark this page URL http://jenkrebs.blogspot.com/2008/04/apartment-therapy.html. Thanks!